When you start Joobik Player the first time, it will sync with the iTunes library on your iPhone, iPod, or iPad. In order for Joobik Player to be able to find any videos on your device, you must have synced some unprotected videos from your PC or Mac to it. In case you're using iCloud, all videos must have been downloaded from iCloud to your device in order to appear in Joobik Player. 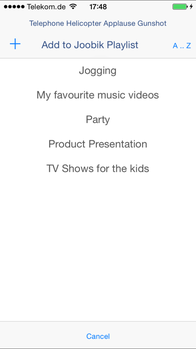 When syncing is finished, tap through all categories on the navigation to see the media synced for a specific category. 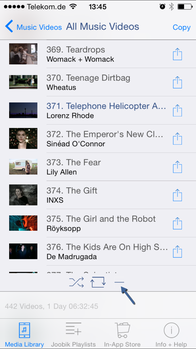 A category will be blue when it has videos synced, or remain grey otherwise. 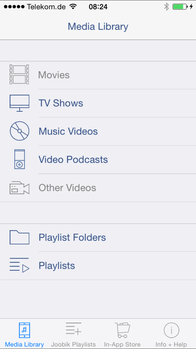 Navigate through the categories to your desired playlist. 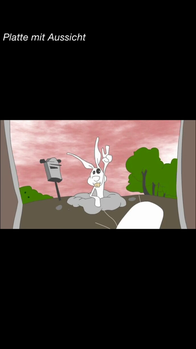 Tap on a list entry to play this video. Beneath the playlist are the play mode controls. Tap on the play mode controls to toggle between Shuffle.. 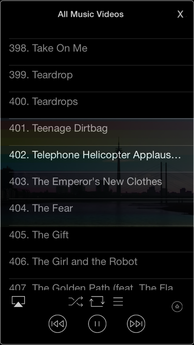 The setting shown here will repeat the whole playlist. To play a single track instead of the whole playlist, tap on the playlist button. To repeat a single track, switch on repeat mode, and single track mode. The play mode settings will be saved per playlist. 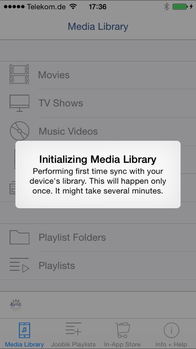 So you can specify different settings for each playlist on your device. Tap on the video screen anytime to show or hide the playback controls. Tap on the bottom left button to toggle between play and pause. Use the bottom slider to scrub. Use the eject button in the lower right corner to stop playing. Tap on the playtime to switch between full duration, remaining, or elapsed playtime. Use the top right button to zoom in and out. Use the top slider to change volume. 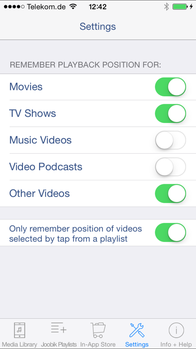 Use the top left button to enable AirPlay. Double-tap on the screen to toggle between play and pause. Swipe left to restart the currently playing video. Swipe left twice within 3 seconds to skip to previous track. Or swipe left once with two fingers to do the same. Swipe right to skip to next track . You can invert the swipe gestures in the app settings. 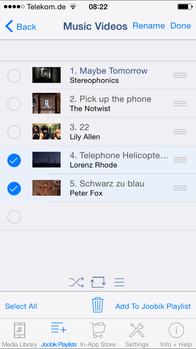 To access the playlist controls while a video is playing, swipe with one finger from bottom to top of the screen. 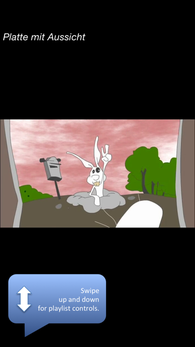 Tap on a playlist entry to skip to it. Swipe down with one finger somewhere below the playlist to hide playlist controls, or tap on the little cross in the upper right corner. To stop playing, tap on the eject-button in the bottom right corner. The overlay playlist controls do even work when playing on AirPlay. Go to the Joobik Playlists tab and tap on the + button in the upper right corner to create a custom Joobik Playlist on your device. 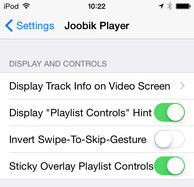 In Joobik Player you can create one custom Joobik Playlist per default. 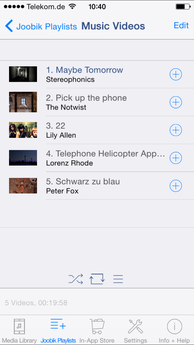 To create more playlists you must purchase the Playlist Premium Pack from the In-App Store tab. 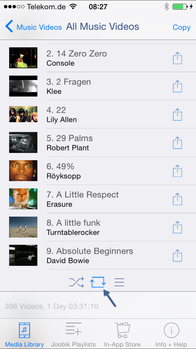 To add a single track to a Joobik Playlist, tap the + button next to the track on any playlist. 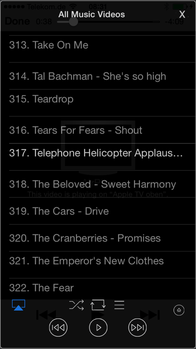 To add more than one track, or the complete playlist to another list, tap the Edit-button in the upper right corner. 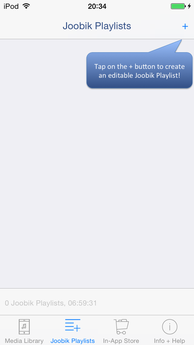 The Add to Joobik Playlist view opens where you can select an existing Joobik Playlist to add the selected tracks to. You can sort the lists alphabetically, or by creation-, or modification-date. Tap the sort button in the upper right corner to do so. If you want to add the selected track to a new Joobik Playlist, tap the plus sign in the upper left corner. Now select the desired tracks, and tap the Add to Joobik Playlist - button in the lower right corner. 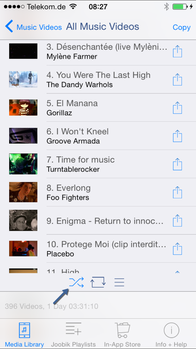 Tap the Select All - button, or the last row of the playlist, to check / uncheck all tracks. 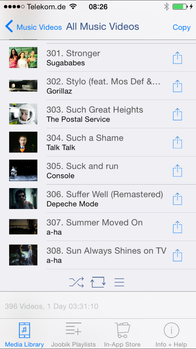 Copying all tracks is especially useful if you want to modify playlists synced from iTunes to your device. While you cannot modify an iTunes playlist directly with Joobik Player (except shuffling it), copying it to a Joobik Playlist does the trick! Note: You can also rename Joobik Playlists in edit mode, as well as rearrange and delete tracks. This is not possible with ordinary playlists. 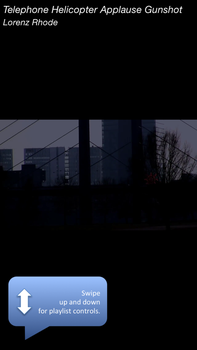 Select how long the track name (and artist name, if available) shall be displayed when a video starts playing. You have several options ranging from never to always. The default is 10 seconds. When a new version of the Joobik Player app was installed, a callout will guide you on how to make the overlay playlist controls appear while playing a video. This callout will be displayed for 10 seconds the first ten times you start playing a video with a new Joobik Player version. Use the Display "Playlist Controls" Hint switch to prevent the callout from appearing, or make it appear again. When you want to skip to the next video, swipe with one finger from left to right. To skip to the previous video, swipe from right to left. If you don't feel familiar with this gesture, you can invert it by turning this switch. When this switch is on (it is by default), the Playlist Controls remain on screen after tapping a button or playlist entry. Turn the switch off to make them disappear immediately after you performed one of these actions. When Playlist Premium Pack is enabled in Joobik Player, it is possible to configure how playback positions shall be remembered. 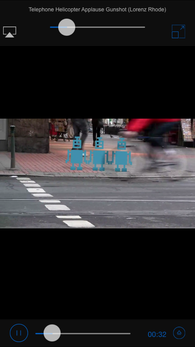 When it is turned on for a specific video type, these videos will continue to playback where you left off. So you can interrupt watching a movie, and continue the next day from the same position. When the Only remember positions of videos selected by tap from a playlist switch is turned on, Joobik Player will only continue playback from a remembered position, when a video is started by tapping it on a playlist. When the switch is turned off, videos will also start from a remembered position, when they are started by skipping to them on the playback interface.